On August 19, 2016, the “SUSY Bet” event took place in Copenhagen at the conference on Current Themes in High Energy Physics and Cosmology at the Niels Bohr International Academy. 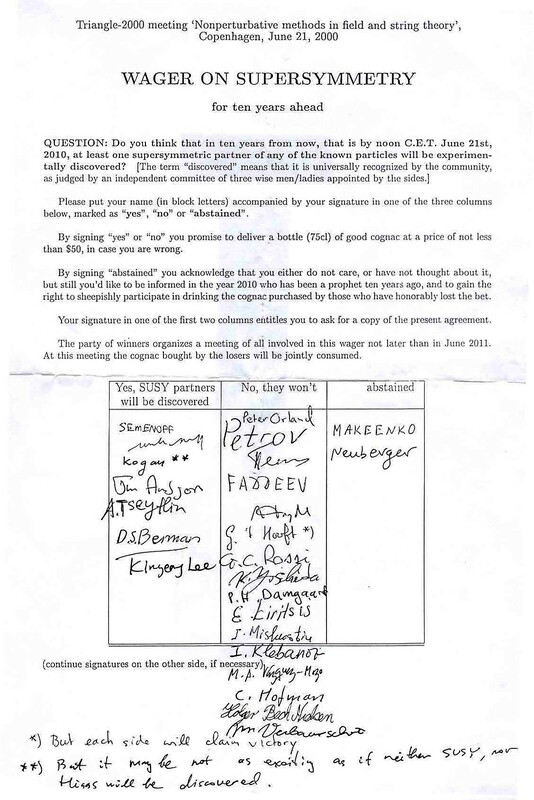 An adjudication of the wager on supersymmetry (SUSY) first made in 2000 was given. The detail of wager is explained in the image below. That after 10 years (from 2000) the Large Hadron Collider (LHC) would have collected enough experimental data to confirm or deny the existence of the supersymmetric particles that the theoretical physicists were thinking about at that time. That supersymmetric particles with sufficiently low masses would be discovered like “sitting ducks” (as Gerard ‘t Hooft put it). At the event, the Yes side of the bet, who believed the particles would be detected, conceded the loss of the bet to the No side. The bet was meant to be decided on June 16th 2016 if no SUSY particle was detected after effectively 10 years of operation of the LHC. The adjudication of the bet was extended by the ‘No’ side by an addition of 6 years due delays in getting the LHC online, part of which was a delay due to an explosion, which caused a delay of 2 years. On the larger question of the significance of the negative LHC results, a recorded video statement by Nobel Laureate Gerard ‘t Hooft (who had bet against SUSY) can be viewed above, and a statement by Stephen Hawking (not in on the bet, but in the audience) claimed that if arguments for SUSY were correct, the LHC should have seen something, so they think nature has spoken and there’s something wrong with the idea. 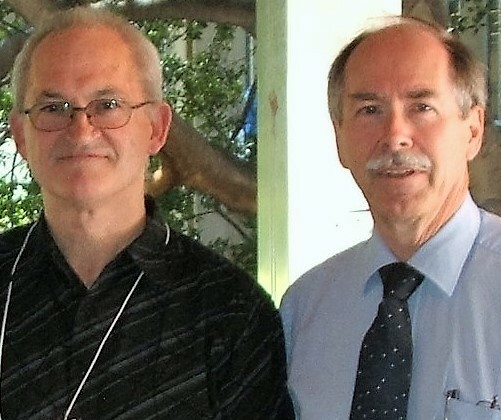 Myself (left) with Gerard ‘t Hooft (right) in 2010 at a theoretical physics conference at the University of Western Australia, in Perth, Western Australia. The losers of the bet who spoke at the event–Arkani-Hamed, David Gross and David Shih–demonstrated the lesson about science that supersymmetry and superstring theory have taught us: particle theorists backing these ideas won’t give up on them, no matter what. They all took the position that they still weren’t giving up on SUSY, despite losing the bet. Gerard ‘t Hooft made the following comments. All evidence so far has been circumstantial at best. No direct evidence has ever been found in support of supersymmetry and hence string theory, because SUSY would be an essential element in string theory.2 String theory does not have any experimental support and SUSY has not fulfilled its promise, therefore it does not help us trust in such a theory. Therefore he found the ‘No’ side won the bet. We all know that the Higgs boson–the so-called God particle–was discovered after the LHC became fully operational but SUSY has not been established. And the Higgs discovery has meant some very important restrictions on the type of fields the Universe might have undergone in the alleged cosmic inflation epoch.3 However there is one more ramification. With the non-detection of any SUSY particles and the essential demise of string theory (that is how good experimental physics should work) it also does not bode well for dark matter. The dark matter crisis has just gotten into a bigger crisis. The best candidate has been experimentally shown now to be extremely improbable. Where does that leave dark matter and the standard model of particle physics? Where does that leave the standard big bang model and big bang nucleosynthesis? In big big trouble. It is a failed paradigm and should be discarded. What is supersymmetry? In particle physics, supersymmetry (SUSY) is a proposed type of spacetime symmetry that relates two basic classes of elementary particles: bosons, which have an integer-valued spin, and fermions, which have a half-integer spin. According to the theory each particle from one group is associated with a particle from the other, known as its superpartner, the spin of which differs by a half-integer. In a theory with perfectly “unbroken” supersymmetry, each pair of superpartners would share the same mass and internal quantum numbers besides spin. For example, there would be a “selectron” (superpartner electron), a bosonic version of the electron with the same mass as the electron, that would be easy to find in a laboratory. Thus, since no superpartners have been observed, if supersymmetry exists it must be a spontaneously broken symmetry so that superpartners may differ in mass. Spontaneously-broken supersymmetry could solve many mysterious problems in particle physics including the hierarchy problem. The simplest realization of spontaneously-broken supersymmetry, the so-called Minimal Supersymmetric Standard Model, is one of the best studied candidates for physics beyond the Standard Model. Superstring theory is an attempt to explain all of the particles and fundamental forces of nature in one theory by modelling them as vibrations of tiny supersymmetric strings. ‘Superstring theory’ is a shorthand for supersymmetric string theory because unlike bosonic string theory, it is the version of string theory that accounts for fermions and incorporates supersymmetry. Since the second superstring revolution, the five superstring theories are regarded as different limits of a single theory tentatively called M-theory, or simply string theory. J.G. Hartnett, Inflation—all in the ‘Dark’, July 31, 2014. MACHO = Massive Compact Halo Objects, which some believe are brown dwarf stars. But if they are, many too few were found in searches for them to have any bearing on the dark matter crisis. Cold Dark Matter and Experimental Searches for WIMPs. Why is Dark Matter everywhere in the cosmos? Is ‘dark matter’ the ‘unknown god’? You may have answered this question before, but is there any latent big bang cosmology in the MOND theory? It seems to help explain the missing mass problem, but so does your rendition of Carmelli’s cosmological relativity theory. that they have found what they call “ghost galaxies” from the surprisingly low amount of visible mass in them. They are saying that they are made of up to 99.99% dark matter. Either that or they are just simply unstable clusters of gasses that will eventually dissipate. However, I think their point was that there are a good number of them, the 47 “faint smudges” it mentions in the article. Perhaps another theory such as MOND or cosmological relativity could explain them? Over the last few decades, astronomers and cosmologists have accumulated vast amounts of data clearly demonstrating that our current theories of fundamental particles and of gravity are inadequate to explain the observed discrepancy between the dynamics and the distribution of the visible matter in the Universe. The Modified Newtonian Dynamics (MOND) proposal (of Mordcai Milgrom) aims at solving the problem by postulating that Newton’s second law of motion is modified for accelerations smaller than ~10^-10 m/s^2. This simple amendment, has had tremendous success in explaining galactic rotation curves. However, being non-relativistic, it cannot make firm predictions for cosmology. A relativistic theory called Tensor-Vector-Scalar (TeVeS) has been proposed by Bekenstein building on earlier work of Sanders which has a MOND limit for non-relativistic systems. This is the abstract from a paper by Constantinos Skordis, “The Tensor-Vector-Scalar theory and its cosmology” available at https://arxiv.org/pdf/0903.3602v1.pdf. It also states that…. In the original TeVeS paper Bekenstein studied the cosmological evolution of an FLRW universe in TeVeS assuming that the free function is given by (26). He showed that the scalar field contribution to the Friedmann equation is very small, and that φ evolves very little from the early universe until today. He noted that with this choice of function, a cosmological constant term has to be added in order to have an accelerated expansion today as required by the SN1a data. Which sounds promising but it has some problems. In TeVeS, cold dark matter is absent. Therefore in order to get acceptable values for the physical Hubble constant today, we have to supplement the absence of CDM with something else. Possibilities include the scalar field itself, massive neutrinos and a cosmological constant. At the same time, one has to get the right angular diameter distance to recombination. These two requirements can place severe constraints on the allowed free functions. In Milgrom’s MOND or Bekenstein’s TeVeS or Carmeli’s CGR theory there is no dark matter. So the ‘ghost’ galaxies are only 99.99% dark matter because either the wrong physics is applied to the measured dynamics of the stars in those systems, or, as you say, the system are unstable. I have a future article coming out on those galaxies.